Although heating your chicken coop is often not necessary, heated chicken coops ensure that your chickens continue to be in comfort during the coldest climates. When buying your chicken coop, you need to know that coops with metal roofs come with an insulated ceiling but insulation is an option with shingled roofs. Chickens typically do not like to be warmed to more than 50 degrees Fahrenheit in our experience. In a right-sized hen house, the chickens own body heat will keep them warm on most winter days and nights. If your coop is especially large for the number of chickens you keep, or temperatures are extreme, it is wise to ensure that your chickens stay warm enough to remain healthy. It is especially important is that drinking water does not freeze. 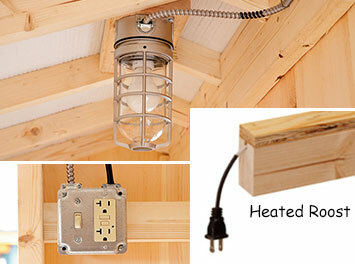 If you are opting for a heated chicken coop or heated roost, you will need electric. For our coops, choose the electric package option, which includes a switch, two outlets and a light. Solar is not powerful enough for heaters. We do not sell heaters for coops, but we do offer heated roosts.. If you do use a heater, we recommend using a space heater that turns off if tipped over and never using a heat lamp. To install your space heater in your hen house put a shelf somewhere high, out of the chickens way in the coop.. You can ask us to install a shelf for you, if you like. These two features will help keep your chickens safe. Our knowlegable customer service specialists can help you with questions about keeping your chickens warm. Call us at 717-553-0215 for questions and orders.